My third great-grandmother Maria Katarina Auttreter (Catharine) had a daughter by her first husband, who my 3rd great-grandfather, Xaver Schillinger, later adopted after they married. Catharine’s first husband, John Moelig, die in June 1861 at Fort Pickens, during the US Civil War. After John’s death, Catharine applied for and was awarded a widow’s pension, which was later converted to a minor’s pension following her remarriage to Xaver. I located the pension record on Fold3.com, and it is more than 40 pages long. It contains a wealth of information! John Moelig died several days after being injured. His right leg was amputated after being run over by a gun carriage, during the discharge of his duties. He was 28 years old, and he died 5 days before his daughter Amelia’s 3rd birthday. John and Catharine were married on M ay 27, 1857 at the First Presbyterian Church in Newburgh, New York. He enlisted on September 21, 1858 (shortly after Amelia’s birth) at Fort Kearney, in what was then the Nebraska Territory. He was an artificer in Company A, Corps of Engineers. After his death, Amelia was given a pension of $8 per month from February 1863 to June 1874 (when she turned 16 years old). Here is a transcript of the file. In some places the handwriting is difficult to read. Undecipherable words are marked with a “?”. Do not remove this slip. This form was created during the digitization process to capture key information for the index. It is not part of the original case file. Minor childe of John Moelig, Priv. Co. A. Engineer Corps U.S.A. Declaration of Identification in Due Form. The Adjutant General reports John Moelig on the muster Rolls of Co. A Battn U.S. Engrs. And Artificer – Died June 1st, 1861 at Ft. Pickens, Fla. For injuries received while in the Discarge of his duty May 21, 1861. John Moelig & Catharina Autretter May 27/57 Verified copy of Church Record. Names and dates of birth of minors. Amelia Josephine Moelig born June 6, 1858. Shown by Baptismal Record. Agent and his A.O. address. Admitted Dec. 22, 1868 to a Pension of $8 per month, commencing Feb’y 11,, 1863 ending June 5th, 1874, and payable Xaver Schillinger, Guardian. FORM OF DECLARATION OF Guardian of Minor Children for Pension, UNDER ACT OF JUNE 6, 1866. On this Sixth day of July A.D 1867, personally appeared before me, Deputy Clerk of the Court of Common Pleas in and for the City & County of New York, Xaver Schillinger aged thirty years, a resident of East New York, in the County of Kings and State of New York and whose Post Office address is Liberty Avenue in the County and State aforesaid, who, being duly sworn according to law, doth on oath make the following declaration, as Guardian of the minor child of John Moelig deceased, in order to obtain the benefits of the provision made by the eleventh section of the act of Congress approved June 6, 1866, granting pensions to the minor child or children under sixteen years of age of deceased officers, soldiers, or seamen, who have left a widow still surviving, and she having abandoned the care of said child or children, or having been declared an unsuitable person to have charge of the same. He further declares that he is the Guardian of Amelia Josephine Moelig whose father was a Private in Company “A” Corps of Engineers United States Army in the war of 1861, and that the said John Moelig died at Fort Pickens, Fla. On the First day of June A.D. 1861; in consequence of injuries received in the line of duty, that the mother of said child aforesaid remarried on the 10th day of February 1863, and that the date of birth of said ward is as follows: Amelia Josephine Moelig born on the 6th day of June 1858. He further declares that the parents of his said ward were married at Newburgh in the County of Orange, and State of New York, on the 10th day of May 1857, by the Pastor of the Protestant Episcopal Church at that place. I hereby constitute and appoint Mathias Goetzel of New York City, my true and lawful attorney, to prosecute this my claim, with full power of substitution and revocation, and obtain the Pension Certificate that may be issued. It appears from the records of this Office that John Moelig was enlisted at Ft. Kearney, NT [Nebraska Territory], 21 Sept./58 for the period of five years. On the Muster Roll of Co. “A”, Battln of U.S. Engn’s for the months of May & June, 1861, he is reported Artifier Died June 1 1861 at Ft. Pickens Fla from injuries rec’d while in the Discharge of his duty May 21, 1861. I have the honor to acknowledge the receipt from your Office of application for Pension No. 13389, and to return it herewith, with such information as is furnished by the files of this Office. It appears from the records of this Office that John Moelig was enlisted at 20 Sept 1858 for the period of five years. On the Muster Roll of Co. A, Corps of Engineers for the months of May & June, 1861, he is reported as having died at Fort Pickens, Fla., June 1, 1861 from injuries received while in the discharge of his duty on the evening of May 21, 1861. The following record is found on page 1[?] of marriage records, vol. 1[?] of 1[?] Pres. Church, Newburgh, NY. “May 27, 1857, John Moelig and Catharine Autretter, both of West Point, NY, were united in marriage. I certify that the record copied in the first page of [?] sheet is correct. It was made originally, and has ever since been (the original entry) in my possession. This 17th day of August 1868. This 24th day of August A.D. 1868 Pastor of 1st Pres. Ch. This certifies that on the 27th day of May, A.D. 1857, John Moelig, and Catharine Autretter, both of West Point, NY, nee, by me, United in marriage, according to the ordinance of God, and the laws, of the State of New York. Given from my book of marriage Records, and will be found on page first. W.T. Sprole. I, D.C. Winfield, Clerk of said County, and the County Court of said County, (a Court of Record,) do hereby certify that John Miller, Esq. whose name is subscribed to the annexed certificate and affidavit, was, at the time of taking the same, a Justice of the Peace of said county, duly elected and qualified and having full power to take the same; and further, that I am well acquainted with the handwriting of said Justice, and verily believe that the signature subscribed to the said certificate and affidavit is genuine. In Witness Whereof, I hereto subscribe my name and affix the seal of said Court and County, this 17th day of February 1863. On this 17th day of February 1863, before me personally came, William T. Sprole, who being duly sworn declares that the annexed Certificate is a true copy from the Records of the Frist Presbyterian Church of Newburgh, of which he is the Pastor. 17th day of February 1863. Pastor of 1st Pres. Ch. This is to Certify, that Amelia Josephine Moelig born the sixth day of June 1858 of John Moelig of Lauterbach, Hesse Darmstadt and of Catherine Autreter, of Dürrwangen, Bavaria, was baptized by the Rev. P. Klahalz on the eighth day of September 1858 in the presence of Henry Moelig and Amelia Brandt as appears from the Register of Baptisms kept at the Church of the Most Holy Redeemer. Revd, Ch. ODonoughue being by me duly sworn according to law, doth depose and say that the annexed certificate of birth and Baptism is a true copy from the records of Baptisms, of the Roman Catholic Church of the Most Holy Redeemer in the City of New York, of which he is the Pastor and the legal custodian of the [?] records. Sworn to and subscribed before me on this 17th day of February 1868, and I do hereby certify, that I have no interest whatsoever in the result of this certificate. No 111 Johnson St. Brooklyn N.Y. Personally appeared before me a Notary Public in and for the County and State aforesaid Charles Pentzel, who being duly sworn according to law, doth depose and say, that he is the legal custodian of the records of marriage of the German Evang. Lutheran St Petri Church in the city of Brooklyn E.D. N.Y. during the alsensor of Pastor Ph. Zapf, who is [?] a visitor in his native country (Germany) and that the foregoing certificate of marriage is a true copy of said records, [?] further say not. Sworn to and subscribed before me on this 24th day of August 1868, and I do hereby certify that I know the affixed to be a respectable [?] and is title to [? ], and that I have no interest in the result of this certificate. Amalia Josephine Moelig born on 6th day of June 1858. He further says that the said child was called Emma by the mother, merely as a nickname and at the time the application was made by the mother she gave the said name Emma by error. Sworn to and subscribed before me on this 27th day of November 1868, and I do hereby certify, that I have no interest in the prosecution of this claim. Died at Fort Pickens Fla.
Respectfully referred to the Adjutant General, for official evidenced of service and death. Letters [illegible] 19 / 68. And sent to Wolf Hass & Co. I do hereby Certify that at the City of Brooklyn in the County of Kings, on the sixth day of October in the year of our Lord one thousand eight hundred and sixty-eight at a Surrogate’s Court then and there held, before William D. Veeder Esquire, Surrogate of said County, Letters of Guardianship of person and Estate of Amalia Josephine Moehlig, a minor, were duly granted and issued to Xaver Schillinger of the town of New Lots and that the same are still valid and in full force. In Testimony Whereof, I have hereunto set my hand and affixed the Seal of the Surrogate’s Court, this sixth day of October in the year 1868. And Whereas, such proceedings were had before the said Surrogate upon the said Petition, that on the sixth day of July in the year of our Lord one thousand eight hundred and sixty seven the said Surrogate did order that the said Xaver Schillinger be appointed Guardian of the person and estate of the said Minor on his making, executing and filing with the said Surrogate such bond or obligation as is required by the statute in this case made and provided: and the said Xaver Schillinger having executed to the said Minor a bond, with sufficient security, approved by the said Surrogate according to the form of the said statute, we do by these presents constitute and appoint you the said Xaver Schillinger Guardian of the person and estate of the said Minor until she arrives at the age of fourteen years, and until another Guardian shall be appointed. Witness, William D. Veeder, Esquire, Surrogate of our said County at the City of Brooklyn, the sixth day of July in the year of our Lord one thousand eight hundred and sixty seven and of our Independence the ninety second. Concerning the proof of Wills, Executors and Administrators, Guardians and Wards, and Surrogate’s Courts. 57. Every general guardian appointed by the Surrogate shall, annually, after such appointment so long as any part of the estate, or the income or proceeds thereof, remain in his hands or under his control, file in the office of the Surrogate appointing him, an inventory and account, under oath, of his guardianship and of the amount of property received by him and remaining in his hands, or invested by him, and the manner and nature of such investment, and his reeipts and expenditures in form of debtor and creditor. And Whereas, such proceedings were had before the said Surrogate upon the said Petition, that on the sixth day of October in the year of our Lord one thousand eight hundred and sixty eight the said Surrogate did order that the said Xaver Schillinger be appointed Guardian of the person and estate of the said Minor on his making, executing, and filing with the said Surrogate such bond or obligation as is required by the statute in this case made and provided: and the said Xaver Schillinger having executed the said Minor a bond, with sufficient security, approved by the said Surrogate according to the form of the said statute, we do by these presents constitute and appoint you the said Xaver Schillinger Guardian of the person and estate of the said Minor until she arrives at the age of fourteen years, and until another Guardian shall be appointed. Witness, William D. Veeder, Esquire, Surrogate of our said County at the City of Brooklyn, the sixth day of October in the year of our Lord one thousand eight hundred and sixty eight and of our Independence the ninety third. Additional sum of $2 per month for the above-named child, until arriving at the age of 16 years, commencing 25 day of July 1866. Acts of July 25, 1866, and subsequent acts. Original Certificate, No. 122940, issued Dec. 30, 1868. Residence, Kings County, and State of N.Y.
Post Office, East New York, Kings Co. N.Y.
No contract, and no material evidence filed since July 8, 1870. Payments on all former certificates covering any portion of the same time to be deducted. Approve, Nov. 13, 1873, LCW, Reviewer. Increase application filed, Aug. 4, 1873, Marriage of soldier to 1st wife, May 27, 1857. Widow a pensioner, Remarriage of widow, Feb. 10, 1863. Dates of Birth of Children. Dates of Death of Children. Custody of Children by Former Marriage. Act of July 14, 1862. Post Office address of Applicant, Buttermilk Falls, Orange Co., N.Y. Declaration and Identification in due Form. Marriage proved by a certificate copy of the record of the 1st Presbyterian Church Newburgh, N.Y.
Name age and residence of child given. Claimant remains a widow. Power of Attorney to Mathias Goetzel of N.Y. City duly acknowledged. Admitted Oct. 22nd, 1863 to a pension of $8 per month, commencing June 1st, 1861. Respectfully referred to the Adjutant General, for official evidence of service and death. May 18 / 63 L. 11/74 Dec., Returned for correction a to officers sig [?] verification of notary. Jun 30/63 Dec received corrected. On this 20th day of May 1863, I Thomas H. Landon Deputy Clerk of the Court of Common Pleas for the City & County of New York do hereby certify that on the 10th day of February 1863, the attached declaration by Catharian Moeleg applicant and Xavier Schillinger and Joseph Jogerst [? ], witnesses was sworn to and subscribed before me, and that I have no interest direct or indirect in the prosecution of the claim. On this tenth day of February A.D., one thousand eight hundred and sixty-three, personally appeared before me: Clerk of the Court of Common Pleas for the City and County of New York Catharina Moeleg a resident of Buttermilk Falls in the county of Orange and state of New York, aged 24 years, who, being first duly sworn according to law, doth on her oath make the following declaration, in order to obtain the benefit of the provision made by the act of Congress, approved July 1, 1862: That she is the widow of John Moeleg who was a Artificer in company “A” commanded by Lieut. Jas. C. Duane in the Corps of United States Engineers in the war of 1861, who on or about the first day of June 1861 at Fort Pickens, Florida came to his death by reason of amputation of right leg which was injured by being run over by gun carriage, aged 28 years. She further declares that she was married to the said John Moeleg on the twenty seventh day of May in the year 1857; that her husband, the aforesaid John Moeleg died on the day above mentioned, and that she has remained a widow ever since that period, and that she has one child named Emma, aged 4 years who resides with her, as will more fully appear by reference to the proof hereto annexed. She also declares that she has not in any manner been engaged in, or aided or abetted the rebellion in the United States. Catharina Moelig Buttermilk Falls Orange Co. N.Y.
Also personally appeared Xavier Schillinger and Joseph Jogerst resident of West Point & Brooklyn in the state of New York persons whom I certify to be respectable, and entitled to credit, and who being by my duly sworn, say that they were present and saw Catharina Moeleg [illegible] to the foregoing declaration; and they further swear that they have every reason to believe, from the appearance of the applicant and their acquaintance with here, that she is the identical person she represents herself to be; and they further state that she has one child named Emma, aged four years who resides with her, that they have no interest in the prosecution of this claim. No. 144 West 42nd Street, P.O. Agents and attorneys require a power of attorney to prosecute claims in the pension office. I Catharina Moeleg, the before named applicant for a widow’s pension, do hereby make, constitute and appoint Mathias Goetzel of New York City in the state of New York, my agent and attorney, to procure for me, from the United States, such pension as I am entitled to, and to receive for me such certificate as may be issued for the same. In witness whereof, I have hereunto set my hand and seal, this Tenth day of February, A.D., 1863. On this Tenth day of February, A.D., 1863, personally appeared before me the above named Catharina Moeleg and acknowleged that she executed the foregoing power of attorney as her free act and deed, for the purposes therein mentioned. I received Mary Katherine Schillinger’s death certificate from the New York Municipal Archives this past week, and it has provided more information that may help clarify the Mystery of the Mothers that I posted before. Unfortunately, it doesn’t seem that this certificate records information about the decedent‘s spouse, other than notating that she was in fact married, so this doesn’t help me confirm that she is the Catherine Schillinger that I know to be the wife of Xaver. The next thing I note is the date of death, which the certificate has recorded as 10 August 1907. I previously have known her death to have occurred on 9 August 1907, so the death dates are within a day of each other. The most telling piece of information is the place of death, which is recorded as 234 Jerome Street. As of the 1900 Federal Census, my 3rd great grandmother Catherine Schillinger was living at 234 Jerome Street. Bingo! She apparently died at home seven years later. The death certificate is a match! Now I want to compare it to Louis F. Schillinger’s death certificate a few decades later, when his mother is listed as Mary Boch. I want to see if I can find any more information that will confirm Catherine Schillinger (née Autretter) is the same woman as Mary Boch. The fact that the death certificate lists her actual first name as Mary and her middle name as Katherine, I think we can draw a preliminary conclusion that the Mary Boch and Catherine Schillinger may be the same woman. However, we want to see if we can explain the Boch surname listed on the son’s death certificate, since we know her maiden name to be Autretter. In looking more closely at Mary Katherine Schillinger’s death certificate, we can look at the information recorded about her parents to see if Boch makes sense. Her father is listed as Xavier Auteritter (which is a close enough spelling variant of our known surname Autretter). Her mother is Magdelina Kaiser (which is a completely new name to me!). There’s no indication that Boch is a surname associated with our Katherine Schillinger. So why would her name be listed as Mary Boch on her son Louis’s death certificate? Her grandson, who was the informant on her son’s death, could have mis-recollected her maiden name. He would have only been nine years old when she passed away in 1907. She was known to be married before marrying Xaver Schillinger, to a man name John Moelig, who was the father of her first child Amelia. John died during the Civil War, and she married Xaver a short time later. Boch is not likely to be explained by a previous marriage. The most likely explanation, therefore, is that by the time of her son’s death in 1943, her grandson mistakenly listed her surname as Boch. I got Louis F. Schillinger’s death certificate today from the NYC Municipal Archives, and now I have a bit of a mystery on my hands. Name of Father of Decedent: Francis X. Who is Mary Boch? That is a really good question. The first thing I want to do is verify other information on the certificate to confirm that I have the correct Louis F. Schillinger. Occupation: listed as retired architect. That’s a match. Address: listed as 169 Van Siclen Avenue, Brooklyn. That is also a match to his last known address. Birthdate: 29 November 1863, Highland Falls, NY. Match. Death date: 3 November 1943. Match. Five other facts match facts I know about my Louis F. Schillinger. I’m confident this is the right person. Back to the mysterious Mary Boch. The next thing I want to look at is who the informant was on the death certificate. In this case, it is Louis Schillinger, his son. The son was born in 1896, nine years before the death of Catherine Autretter, so as he would have known his grandmother early in his life. The family all lived within blocks of each other while he was growing up, so he likely saw his grandparents on a regular basis. It’s reasonable to assume that he would have reliable knowledge about his grandparents’ identities. This leaves me with a bit of a conundrum – who is Mary Boch and why is she listed as the mother on Louis F. Schillinger’s death certificate? Now I have a new family mystery to solve. 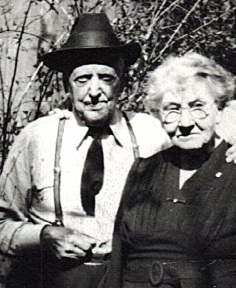 Louis Schillinger and Louisa Bauer were married on 21 September 1885 in East New York. I recently acquired their marriage record from the New York Municipal Archives, and it contains vital clues to further research on the Bauer family. Previously, all I had confirmed was that Louisa Bauer’s mother was also named Louisa, as she shows up in census records as a widow living with her daughter and son-in-law. I did not know the father’s name or the mother’s maiden name. Now I do, thanks to this valuable vital record. Louis Schillinger married Louisa Bauer on 21 September 1885. Both were residents of East New York at the time of their marriage. Louis was 22 years old and Louisa was 20 years old (which would make their birth years approximately 1863 and 1865, respectively). Louis was working as an architect. It was the first marriage for both of them. Here’s the really exciting news! Louisa’s parents are listed as Anton Bauer and Louisa Hoefler. The attestator [witness] was A. Nieman of East New York.